On Saturday, April 15, 2017 the tennis community gathered to remember Joan McCormick, our long time member of the Bay Club – The Gateway and FOGG at the Bay Club – The Gateway tennis courts. Please see these two photographs. We thank Karen Mack for providing them. FOGG supporter Merri Baldwin, who gave a donation to the Summer Kids Camps Scholarship Program, has asked that members who wish to donate to the Scholarship Program, and at the same time remember Joan, make their donations with the note that it is in memory of Joan. FOGG sees this as a win-win. You can recognize Joan’s contribution to the continued success of the Bay Club – The Gateway, and you can provide the funds allowing girls and boys from low income housing to enjoy a summer of fun in a safe, family friendly environment. Remember, for every dollar FOGG raises we receive a matching dollar from the Bay Club. If you have already donated and wish it to be in memory of Joan, please email FOGG with your request and we will see that it is included on the Memorial list. Should you prefer to donate online, you can do so at this FOGG website. Click on the “Donate to 2017 Summer Kids Camp” yellow donation button, and add that you are donating to Joan’s Scholarship Fund Memorial. FOGG looks to your continued support, and in remembrance of Joan. Joan McCormick – Celebration of a Tennis Life! 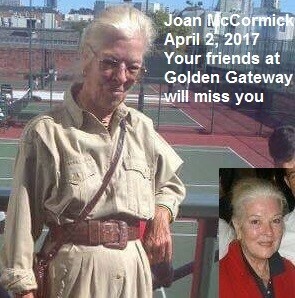 Joan McCormick passed away last week. Joan was an original member of FOGG, beginning when we began, in 2003. The tennis community will gather in Joan’s honor to remember her at the Bay Club – Gateway, on courts 7 and 8, this coming Saturday, April 15, 2017 beginning at 12 pm. We welcome our FOGG supporters to come by and celebrate Joan’s life and her love of tennis. Joan gave her tireless effort to help save our Club from being demolished and becoming luxury condominiums – the 8 Washington Street development. This will be an informal potluck and Joan’s friends are encouraged to some food or drink to share. Your stopping by to celebrate Joan will be greatly welcomed. FOGG looks forward to seeing you this Saturday. The Summer Kids Camps begin on Monday, June 5, 2017 at the Bay Club – The Gateway. FOGG’s desire in this, our 7th year of the Scholarship Program, is that we can provide the funding to have as many boys and girls from low income housing areas attend Kids Camp this summer. We have had a good start in receiving your tax deductible donations, for which we deeply thank you. We still have a way to go so we can add many more youngsters who are awaiting our OK. Remember we must have the dollars in hand before FOGG can sign up a boy or girl to attend. FOGG also must once again thank the Bay Club management for matching dollar for dollar what we can raise. It makes a great deal of difference. Should you prefer to donate online, you can do so at this website. Click on the ‘Donate to 2017 Summer Kids Camp’ yellow donation button. Let’s make FOGG’s 7th year in sponsoring the Scholarship Program a great one!